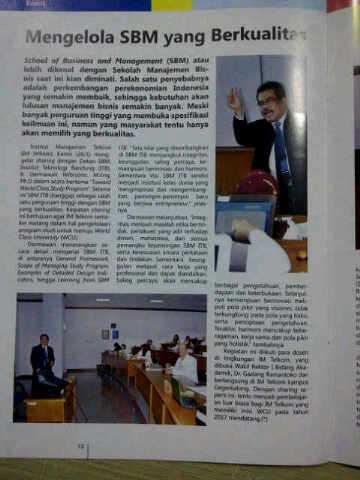 I am a lecturer of School of Business and Management, Insitut Teknologi Bandung (ITB) in Indonesia. We have just finished our responsibilities related to ITB, and we are conducting research with professors including Prof. Kyoichi Kijima. He used be ITB’S visiting scholar sent from Tokyo Tech. Seven years ago, we built our school, School of Business and Management at ITB. We chose to come to Tokyo Tech because we knew that Prof. Kijima has an international reputation in his field. He introduced a new subject, quality service science. We tried also to develop other collaborative relationships between Indonesia and Japan. Hopefully, we continue to send our staff as lecturers to Japan. Japan is very clean. The Japanese are very humble, and they receive us as Asians. I have studied in Australia and also in the U.K. I think that their sense of individuality is stronger than here. Tokyo is too clean from the standpoint of developing counties. People here welcome us. Some people might have food problem in Japan, but food here is OK for me. My prospect for the future is that our research will get more concise and we will be able to offer new courses to our students at ITB. I expect that we will develop our cooperation not only with Tokyo Tech, but also with Tokyo University of Science (TUS) in Japan. We are already cooperating with Japan, Malaysia and other countries, so that we can grow up to the international standard. The theory of multiple intelligences is now accepted widely and when combine with the realization that intelligence can be developd throughout life, offer a powerful inspiring Renaissance men and women. The 3rd ICTOM 2012 International Conference on Technology and Operations Management (ICTOM 2012) will be held in Institut Teknologi Bandung, Bandung, West Java, Indonesia during July 4th-6th, 2012. Managing Director of KLIA Berhad. Former Chairman of Industrial Building System, Construction Industry Development Board (CIDB) Malaysia. Yes – come to Budapest and have a unique tailor made program. DetailsLet people know what you’re up to, or share links to photos, videos, and web pages. To become more responsive and effective, governments are experimenting with the way they monitor services (Indonesia) and work with the private sector to expand the economy (Colombia). McKinsey’s public-sector practice, under the editorial leadership of Eric Braverman and Nick Lovegrove, presents a collection of “snapshots” that capture people, places, and strategies now bringing about bold, rapid, broadly applicable management innovations in governments around the world. The series—based on field reporting and on interviews with officials, senior executives, academics, and nongovernmental organizations—examines sustained, significant initiatives to help governments become more effective and responsive rather than endorsing political choices that are not ours to make. We continue the series here with two entries: a report on Indonesia’s experiment with new ways to monitor government services, as well as an update on Colombia’s work with the private sector to expand the economy. Stay tuned for more insights later this year. For more information on innovation in government today, we invite you to visit the Innovation Navigator. The government is helping citizens on the street to monitor and verify the delivery of state services. Challenge: The Indonesian government must work to alleviate poverty, improve education, implement economic and financial reforms, stem corruption, address climate change, and control infectious disease—all while responding to natural disasters. Delivering these services effectively is essential to maintain confidence in democratic government at a time when the country is just 12 years removed from almost four decades of authoritarian rule. To address the challenges, the world’s fourth-most-populous country (and third-largest democracy) has to communicate in an open, reciprocal way with a heterogeneous citizenry of 245 million people, who speak dozens of local dialects and live in 30 provinces across more than 17,000 islands and three time zones. Emerging solution: In December 2009, the government set up the Presidential Unit for Development Supervision and Control (UKP4) to monitor and verify the delivery of state services with the help of engaged citizens and to break bottlenecks among ministries. UKP4—led by Kuntoro Mangkusubroto, a former energy and mines minister who led Indonesia’s recovery after the 2004 tsunami, and reporting directly to the office of the vice president—provides real-time information on the state of Indonesia’s key economic, infrastructure, health, and poverty indicators. In November 2011, it launched a Web and SMS-accessible platform called the Public Participation Information System (LAPOR, its acronym in Indonesian, means “report”). The new unit lets citizens monitor and verify the delivery of government services in real time. Indonesia’s government also uses this information to improve the way it allocates public resources in areas ranging from education and health to energy and defense. In November 2011, for example, the Ministry of Public Works reallocated resources for its 2012 infrastructure action plan in the Aceh region after a citizen sent UKP4 an SMS text message about a bridge that hadn’t been rebuilt after it collapsed in June 2011. LAPOR enables Indonesians to communicate with the national government through brief text messages, e-mails, online comments, or uploaded photos. To use mobile phones1 for these postings, users simply download an app that lets them send SMS text messages directly to UKP4. When UKP4 receives a message, it conducts a preliminary verification through government databases and open-source research. After determining that further investigation is warranted, the unit posts a summary of the problem on LAPOR’s Web site (so that the public can view and provide additional commentary on it) and notifies the relevant government ministry. Ministry officials then follow up on the problem and may release a public statement explaining what they will do to fix it. Citizens have up to a month to monitor and verify this response. UKP4 refers to the ministry any additional comments received and closes the ticket if it doesn’t get any. Indonesia had roughly 220 million mobile-phone subscribers in 2010. The many hundreds of messages the team received during the first few days of live action represented only the beginning of a robust two-way dialogue with citizens. The government acknowledges that given the country’s geographic diversity and large population, it must not only get citizen input on the delivery of services but also actively solicit that information instead of waiting for complaints to arrive. On occasion, UKP4 will even ask people in specific places to report on the way local governments deliver services: after determining which registered mobile-phone users are close enough to investigate, it can send them inquiries via SMS. As of November 2011, the government had agreements with two mobile-phone operators, Indosat and Vodacom, to disseminate these messages.